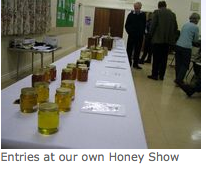 This year's Honey Show will be held on Tuesday 13th November, at 19:00 with staging from 18:45. We are fortunate to have a very experienced judge, Sue Carter from the Chalfont Beekeepers' Society. Last year there were 85 entries from 20 members so we hope to have an even more enthusiastic response this year. Please note there is a new class 6 which is 3 x 454g jars of honey labelled ready for sale. Last year a few members overlooked the need to pre-book if they had more than one entry and arrived with multiple entries on the night. There is a lot to do in a short time to set up the show so do please remember to book in advance. It is easier to delete an entry record if you change your mind than to create a new one just prior to the commencement of judging. It was a pity that a few entries had to be disqualified by the judge because they did not comply exactly with the schedule’s specification. In particular it is important to remember to cover food items, and this year’s revised requirements for ingredient lists. We encourage all Members to enter the show; even if you are a complete beginner as there is a Novice entry class, so have a go! Don't have your own honey? You can still enter. Bake a honey cake, make some candles or submit a photograph. See the Honey Show Schedule for details. The best place to find detailed information about producing jars of honey for showing is on the National Honey Show website. However, our Honey Show is very informal so don’t be put off, just see it as guidance as to what is expected. We require only one instead of the normal two jars per class, eliminating the need for matching jars and lids, though they should be the standard 454g/1lb honey jar with metal screw lid. Do pay particular attention to the condition of the jar and lid, as imperfections in the glass or dents and scratches could mean an entry being rejected by the judge. The honey should also have been filtered through a fine enough filter to remove any imperfections before bottling, which should be standard practice anyway, so all that remains is to prepare it to the class specification. This is not as daunting as it sounds – the ‘Run Honey’ classes, i.e. Light, Medium, Dark, or the Novice class, need to be clear of any granulation, but this is easily achieved by warming the jar in fairly hot, but never boiling, water for a few minutes until it clears. There should be no bubbles, foreign bodies or dust on the top, so a clean environment whilst preparing and putting a clean lid on quickly when finished will help. Creamed and Granulated are not quite so easy though they should have had impurities removed by filtering initially or being allowed to settle and granulate and then the top skimmed before being prepared for bottling, with any further air bubbles skimmed off a few days after bottling. It is always advisable to overfill the jars a little so that after skimming there is no daylight between the surface of the honey and the bottom of the lid. Start the preparation in plenty of time to achieve the result you need a few days before the Show. If you have left it a bit late for all this and are not happy that it meets the minimum standard, then enter the ‘Black Jar’ class which is judged on taste alone. A paper sleeve is provided at the show. If you have a really good frame suitable for extraction to exhibit, clean it carefully so as not to damage the comb but to remove excess wax and propolis. It will need to be in a bee-proof glass case, available from most suppliers, or possibly one could be borrowed from a fellow beekeeper. The Honey Cake class is always popular for Beekeepers and their families alike, the recipe for it is available in the Schedule section. The thing to remember here is not to heat the ingredients too much and to allow the mix to cool enough before adding the eggs and flour. Don’t be tempted to scrape the bowl into the tin, as unmixed flour etc can spoil the final result. Above all, read the schedule and make sure you understand all the requirements for the class you are entering. Your Honey Show Secretary will be please to help with any advice. Do try your hand at showing this year, it gives a great sense of achievement and the helpful comments from our Judge will give much encouragement to those new to the art. Good luck! !